This graphic explains how we can gather the necessary information from the Component, Service and Business Capacity Management processes (Blue) and start to correlate the information together (Green) and then feed the information back to other ITSM processes (White). This not only provides other processes with a valuable insight into both the performance and capacity of Services, it also can identify key business patterns of activity to help select modeling periods for Capacity Plans, feed SLM reporting, provide information for KPIs such as numbers of incidents caused by Capacity or Performance issues or outages and provide root cause analysis information for Problem. For Capacity Planning purposes, the importance of being able to correlate application transaction information with component usage is extremely important as this slide demonstrates. 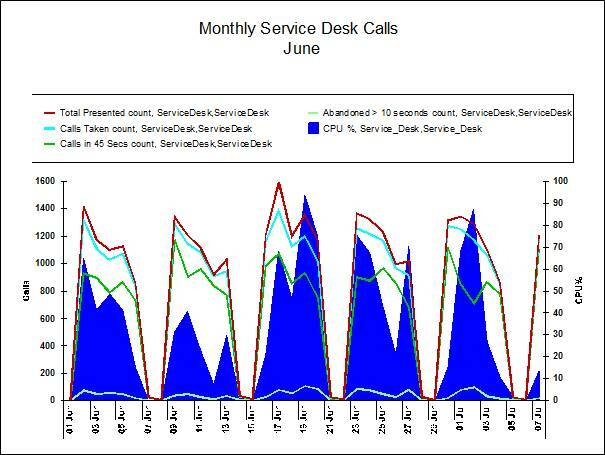 The example here plots the number of Service Desk calls being reported through the application and its servers CPU usage. Note the correlation between the rise in calls and the CPU usage. From this we can start to look into producing models of an increase in numbers of Service Desk calls and its impact on the existing infrastructure used to attempt to identify a pain point and prevent slow performance or service failure. All of this can be achievable through implementing an enterprise Capacity Management tool that not only captures and stores data from all sub processes into a CMIS, but has the reporting and planning capabilities as mentioned throughout. Please note though that you need to be careful on assuming that a simple trend on the CPU will suffice here due to the utilization laws as mentioned earlier on.